You know those design recommendations that urge you, especially when hesitant, to start with a picture and base your color selections on it? Here are some ideas on how to achieve it with a geeky starting point. I’ll select a photo, a painting, a still, a screencap or the like that is geeky in some way, and use mainstream photos to illustrate how a color combination pulled from that model image might work in real life. 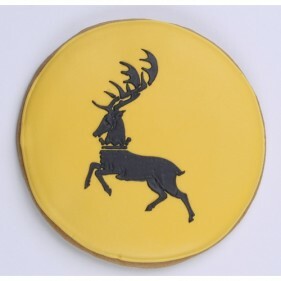 House Baratheon Sigil Cookie. HBO Shop. In heraldry, gold is often depicted with yellow. 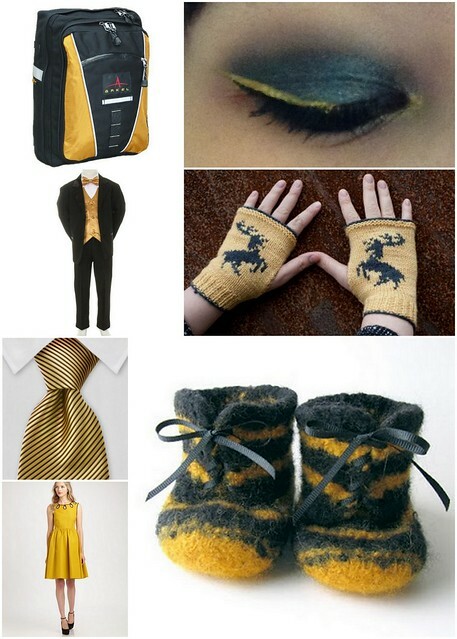 I will, therefore, include both gold-black and yellow-black combinations below. Cerasa; image via Home Designing. Sherri and John at Young House Love. Martha Stewart; image via Centsational Girl. Top row: Mini black with gold interior drum shade from The Accessory Store; custom knobs by Alison Brent on Etsy; color block pillow by Mazizmuse on Etsy. Center: Painted credenza by Kathy at Petticoat Junktion. 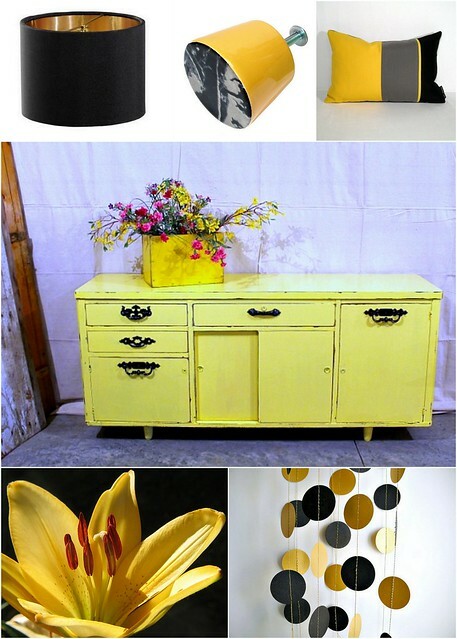 Bottom row: tiger lily photograph by Audrey; gold and black garland by HoopsyDaisies on Etsy. Clockwise from top right: Baratheon eye makeup by Thedethlands; fingerless gloves by Anna Richardson for The Yarn Cafe Blog; custom felted baby shoes by Shannon at The Kitty Pad; Kate Spade Rainey dress; tie from GentlemanJoe; Sears gold bowtie vest suit; Arkel backpack / bike pannier from Universal Cycles. What do you think – a keeper combo or not? P.S. Access other posts in the series with the geeky color combos tag.